This article by Jeff Kettle, ‎Lecturer in Electronic Engineering, was originally published on The Conversation. Read the original article. 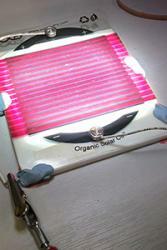 Organic Solar cells: image courtesy of Iwan Saunders Jones.Organic solar panels might be the answer. They’re cheap, and are flexible enough to power minuscule sensors whatever their shape. The cells can be just two micrometres thick – around a 50th the width of a human hair – but they are able to absorb a huge amount of light for such a thin surface.